We went to see Disney On Ice: Frozen. It's a tradition for us to go whenever it comes on Oklahoma. It's really thanks to my Mom that we get to go. She buys the tickets and drives up from Texas. 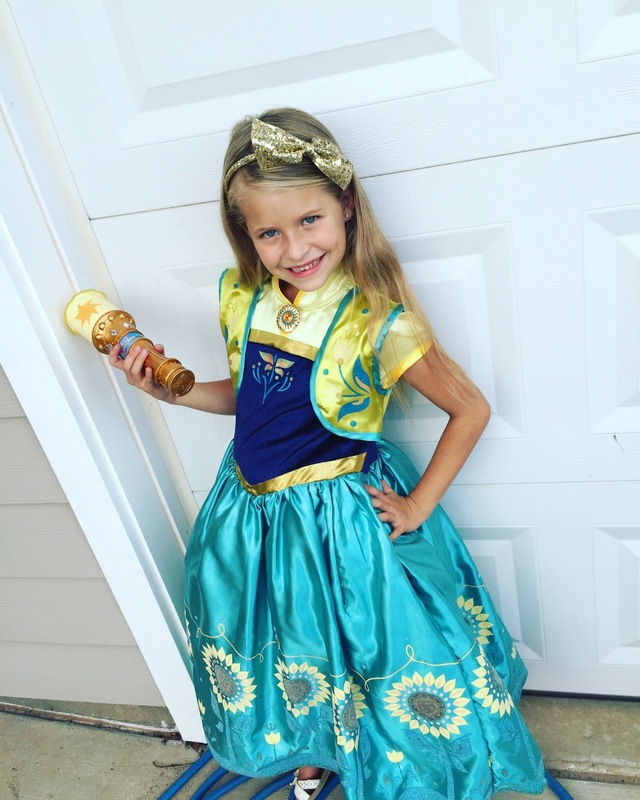 Natalie decided to wear her Anna Frozen Forever dress. It was a big hit because most girls wore the typical Elsa dress. Or the Anna dress from the movie. I think I only saw one other girl in this Anna dress. 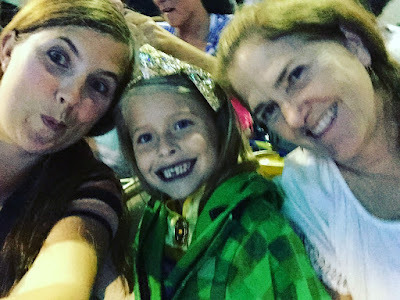 We had a fantastic time and if you're heading to see a Disney On Ice show, here are some tips. 2. Also be prepared to pay $15 for cotton candy. It does come with an Olaf hat or a crown, but still. 3. You'll be amazed at all the people in the show. This Kristoff? Did a BACKFLIP on the ice. A BACKFLIP! I can barely walk on solid crown and this dude is backflipping on the ICE? 4. You'll have to battle all the people at intermission if you need to pee or buy more expensive stuff. Seriously. The lines were stretched out of the women's bathrooms. So I went to the one wayyy down the hall. No line! 5. You'll laugh at Sven. When he first came out and I saw the tongue, I was like, "Here comes Miley Cyrus!" 6. You'll think it's cute when the kids sing along with all the songs. 7. You'll want to touch the snow that is falling down from the ceiling. It does this several times during the show. Because, you know, Elsa. And cold. And snow. 8. The show is pretty similar to the movie, but there are slight changes. Your kid will point them out. 9. You'll laugh when you tell a father how you think it's sweet that he brought his daughter and he replies, "I was forced." You'll also laugh when you tell them that they can buy more food during intermission if they need to and they shout, "There's a damn INTERMISSION?" 10. You'll be amazed that no one has fallen across the ice. But these are all professionals. Everyone was amazing. The costumes are gorgeous. 11. You'll know it's all been worth it when you watch your daughter dancing through the halls because you know she'll soon grow up and might say, "I don't like Disney princesses anymore. Buy me One Direction stuff." And did I mention Miley Cyrus? 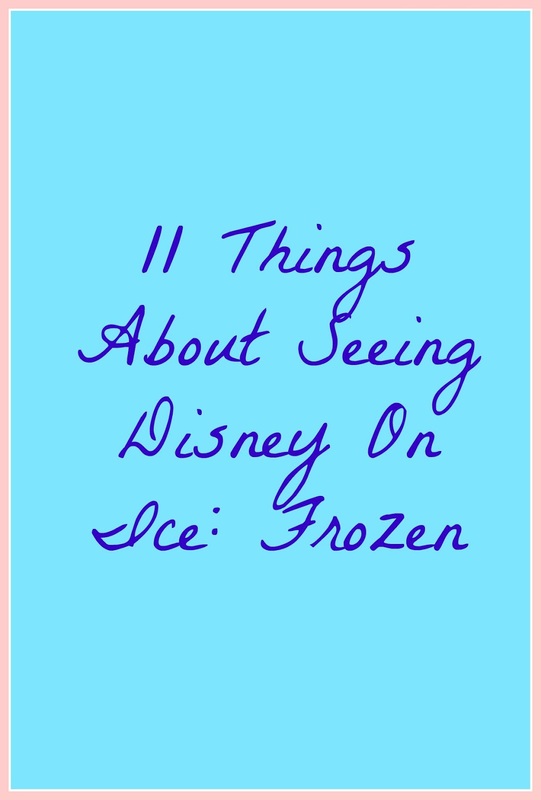 Have you seen any of the Disney On Ice shows? the 5 yr old is into frozen so i appreciated your review on this!! and i can imagine the snow cone cup will be purchased! So cute! Yep, or she tells you "I'm dying my hair purple and listening to Indy rock." Girls are crazy! Holy moly, $12 for a snow cone??? And $15 for cotton candy?? Wowzers, thats highway robbery!! I've yet to see Frozen, thank god!! Lol about the Miley comment. The guy playing Kristoff looks like a Ken doll. I haven't attempted Disney on Ice with my kids yet. I love Disney on Ice...but boy are the concession stands a racket! Sven is looking very goofy! Sounds fun! I bet my girls (9 & 4) would love it. 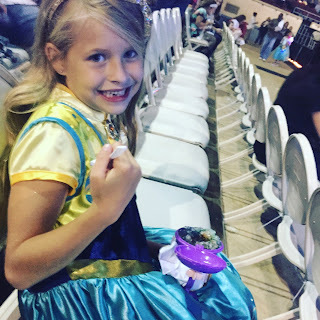 Glad to hear that none of the performers fel - we saw Disney on Ice 3 or 4 years ago and Princes Aurora fell spectacularly on her bottom. I felt bad for her but it was still kind of funny. Nope, not yet! It sounds so much fun! 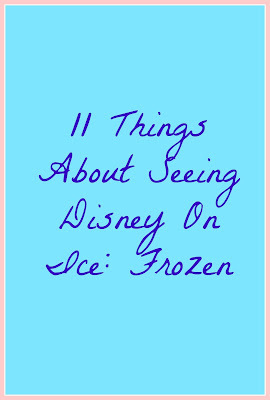 We have not been to a Disney on ice show yet, but I would love to see one someday. I think we'll skip the treats though! ha! Sven looks amazing. Kristoff too. I absolutely thought you were exaggerating about the prices, but I believe you now! This looks AWESOME! I need a kid to take, haha!